Compete in the Post-Match SOAP® with Electronic Residency’s Program Compatibility Search (PCS) system. Introducing Electronic Residency’s Program Compatibility Search (PCS) system. Compete in the Post-Match SOAP® like never before with the only residency program compatibility search engine, built to help you pick residency programs during the Post-Match with speed and accuracy. Simply search programs from NRMP’s® List of Unfilled Programs into the PCS for instant results. By plugging in any program’s 10-digit ACGME® code, you will receive immediate results for whether or not you qualify to apply to any residency program with a definitive "Yes" or "No" answer and supporting program requirements analysis based on your credentials. No questions, no confusion, just results. All search results are based on a detailed and updated list of program requirements to help you locate the most relevant programs while discarding other less suitable programs. You won’t have to worry about wasting any of your 45 applications by picking incorrect programs. The PCS’ user-friendly interface and Bookmarking feature will allow you to easily navigate through your program research and organize programs you are compatible with to never lose track of a program. Get registered with Electronic Residency for free and enter your professional credentials. Activate any specialties you plan on applying to during the Post-Match SOAP. During the Post-Match, open your List of Unfilled Programs from the NRMP® R3® System and your Electronic Residency List. 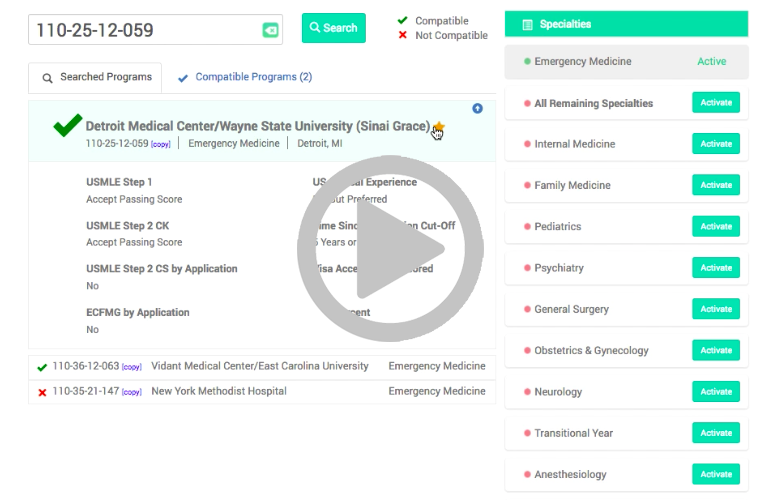 After obtaining your NRMP® Unfilled List, use Electronic Residency by copying and pasting the program’s ACGME® 10-digit code into the Program Compatibility Search (PCS), and view instant results whether or not you qualify to apply to your program of interest with detailed program requirements. Based on the PCS results, choose whether or not you will use one of your 45 applications on the program you searched. Continue searching programs until you have picked 45 programs to select within ERAS®. After activating any specialty and entering your credentials, simply paste the ACGME code into the search box. You results will appear instantly with either “Yes” or “No” and the program’s requirement details. If the answer is “No,” the system will also show you the requirements you did not qualify for. Where do I find the List of Unfilled Programs? The List of Unfilled Programs is only offered by the NRMP® R3® System. Do I get access to all specialties? You will have access to whichever specialties you choose to purchase. Pick the All 18 Specialties Package in order to have access to all specialties. I have an individual specialty, can I upgrade? How can I find programs I searched in the past? Your Search History will stay up-to-date with every search you make and is available directly on the PCS page with the compatibility results. Can I keep track of the compatible programs I want to apply to? Yes. You can use the Compatible Programs Feature to see the compatible programs you have searched during the Post-Match SOAP. There is an additional tab for ‘Compatible Programs’ that will be enabled once you have searched a compatible program using your Unfilled List from NRMP®. You can also star your favorite programs and apply a filter to view only your Starred programs. NATIONAL RESIDENT MATCHING PROGRAM®, NRMP®, SUPPLEMENTAL OFFER AND ACCEPTANCE PROGRAM®, and SOAP® are registered trademarks of National Resident Matching Program. THE MATCH™ is a trademark of National Resident Matching Program. Electronic Residency, Inc and this website are not sponsored by, endorsed by, or affiliated with National Resident Matching Program.